Style: Autumn Trends with Yours Clothing. London Fashion Week will be fast upon us, and September is what I've now come to know as 'silly season'. Being more involved in the fashion industry, it's become apparent that over the summer, everything goes a little quiet and then BAM September hits us and it goes event crazy. 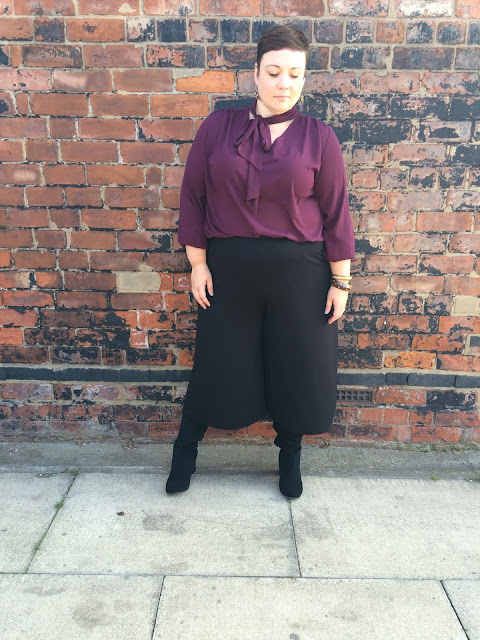 All the new AW ranges hit the shops and for a blogger, it all kicks off again, which, for a mum like me is actually quiet perfect. I get the break with Poppy and then when she's back in school I can throw myself whole heartedly into fashion fun times. Today I'm exploring the 70s trend with Yours Clothing. Instead of the usual boho style that's been exhausted by the high street, I've gone for something a little more chic. 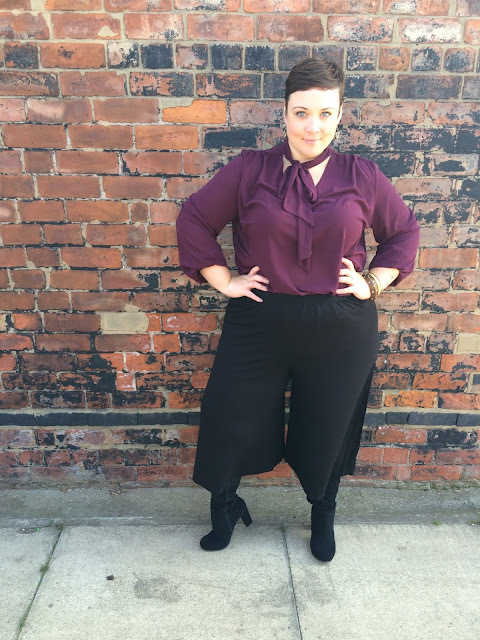 I'm wearing a 22 in both blouse and culottes, both of which are true to size and fit really nicely. In fact I wish I'd had the culottes over the summer, they would have been awesome over a bikini on my holiday! The boots are from Yours too and fit great. They are a stretch fabric and fit over my substantial 20 inch calves. Hoorah! Now I was a little worried that with my short hair this would end up looking a little bit nunty and not quite the fashion look I was trying to achieve and although I feel I might be a little off the mark, I am rather enjoying living out my Lily Tomlin/Jane Fonda/Dolly Parton 9-5 fantasies. Working 9-5, what a way to make a living. Looks great on you. Just wondering what height you are. Love the culottes with the boots but at only 5'2 I'm not sure I could pull off the look. 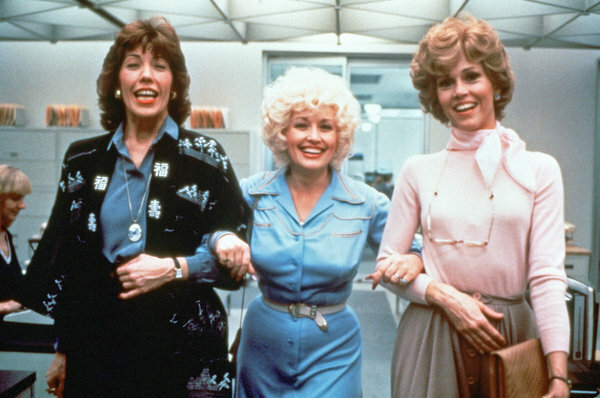 OMG, I just watched 9-5 for the first time since I was a kid, and HOLY MOLY is that different than I remembered, I think all these years I was just remembering working girl and not 9-5 but it was SO much fun! This colour on you, is fab-u-lous!! It's such a brilliant film but yeah when you watch it as I kid you just remember all the funny bits and running around hahaha!! That blouse is divine and it looks fabulous on you. I wish I was more fancy sometimes. I love wide leg pants but being a bit of a short arse I think they would be more ankle grazers on me!